Do you plan your meals for the week? There was a time when I shopped almost daily, made what I felt like, ate out on a whim and watched groceries wither and die in the fridge. Nowadays, I find having one less thing to worry about each day is really worth the time spent on Sundays making a plan for the week and shopping all at once. It very much helps to ensure have healthy, hot food on the table each night. I generally plan for each meal to last two nights – either as the same meal or using the same base – so I’m only doing a ‘full cook’ every second night. Like this delicious soup I made tonight. Mommydo’s Made Up Hamburger Tortellini Soup. It was delicious and easy. Take a look down below to see how to make some of your own. We’ll have more tomorrow. Then Tuesday, I’m planning to make Chicken Tacos using this recipe except I’m gonna use boneless chicken breasts. Thursday, I’m making this shepherd’s pie. Saturday, I’m gunning for takeout! The next step in my meal planning for me is to post the list and make the recipes available for my DH who claims he would cook more if he knew what to make and how to make it. I’m doubtful, but hey, it’s worth a shot. 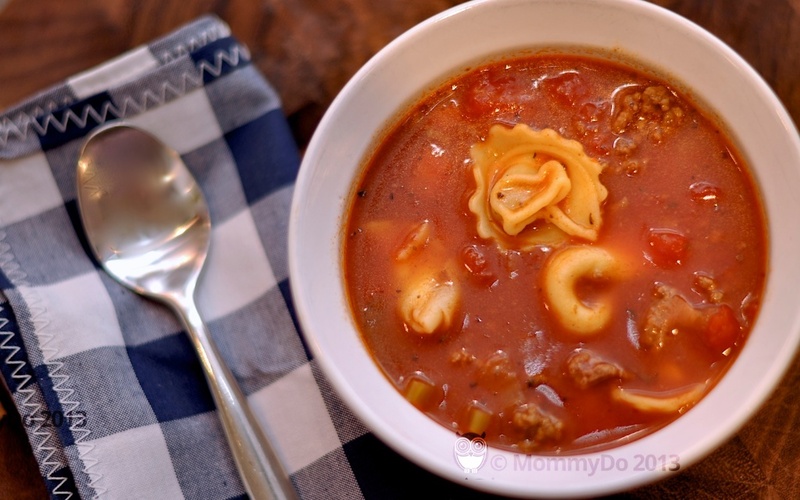 RECIPE: Mommydo’s Made Up Hamburger Tortellini Soup. Brown the meat with about 1/2 an onion. Put it in the pot with a large can of diced tomatoes, a small tin of tomato paste, about 3 cups of beef broth, 1 chopped celery stalk and 1 chopped carrot. Include about 1/4 teaspoon of all the dried herbs and spices listed. Simmer for about an hour. Add extra water as needed to ensure it stays soupy and not like spagetti sauce. Increase the heat so the soup is boiling gently and cook until the Tortellini is nice and soft. Is delicious served with parmesan cheese on top. cooked from scratchfoodfrom scratchMommyDorecipeWhy Is It Never Takeout Day? Sounds so delicious! I don’t meal plan, but I used to and I would love to get back into the habit! It is a time and food saver for sure.